Peregrine Falcon, Loantaka Brook Reservation, NJ, Jan. 16, 2014 (photo by Mitch Van Beekum). The Peregrine Falcon above was found and photographed today at Loantaka Brook Reservation by Mitch Van Beekum. 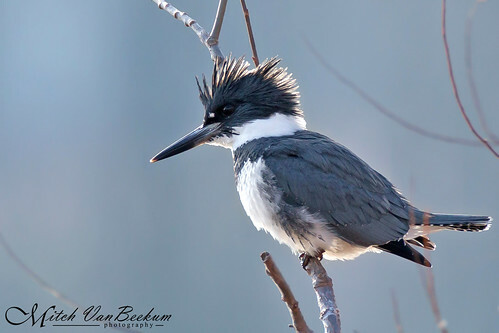 Mitch photographed the Belted Kingfisher below yesterday at the same location. The continuing Greater White-fronted Goose at the Lord Stirling park equestrian fields on Lord Stirling Road in Bernards Twp. was reported to eBird by John J. Collins. The 5 Redheads of 290 Davidson Ave. in Franklin Twp. remain in the drainage area of a corporate park (Beth Scott). The Redhead continues at Amwell Road Pond in Hillsborough Township. 3 of the 6 Sandhill Cranes of Randolph Road, Franklin Township were reported today (Robert Skrabal). A drake Common Goldeneye, 2 Hooded Mergansers and 2 Bufflehead were in the only open water at Boonton Reservoir late this afternoon. This is the north end where the Rockaway River feeds into the reservoir. Yesterday at 4:30 p.m. at a frozen Budd Lake, there were 1,600 gulls on the southern end of the lake by the municipal beach. Most eventually flew off towards the south. Today at 3:40 p.m., there was not a single gull on the ice. This entry was posted in Morris County, Somerset County and tagged birding, birds, migration, mocosocobirds, Morris County, nature, ornithology, Sandhill Crane, somerset county. Bookmark the permalink.